Well it’s officially official. 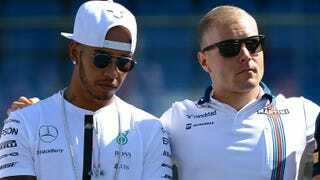 Bottas to Mercedes AMG. What are your thoughts on it? Personally I’m optimistic about it. First off, he’s not as ego-driven as Nico was and he’s a good enough driver to make podium in a Williams, so I’m interested to see what he can do in one of the Silver Arrows. I would’ve loved to see Verstappen get the seat, but imagine how much more drama we would’ve gotten (is that really a bad thing though?). Riccardo would’ve been my second choice because it’s impossible to hate the man. Like I said though, I‘m optimistic about choosing Bottas. Just happy they didn’t go with Wehrlein or Magnussen.